This post is part of the Steven Spielberg Blogathon hosted by Adam Zanzie of Ice Box Movies and Ryan Kelly of Medfly Quarantine. Click here for the Blogathon. 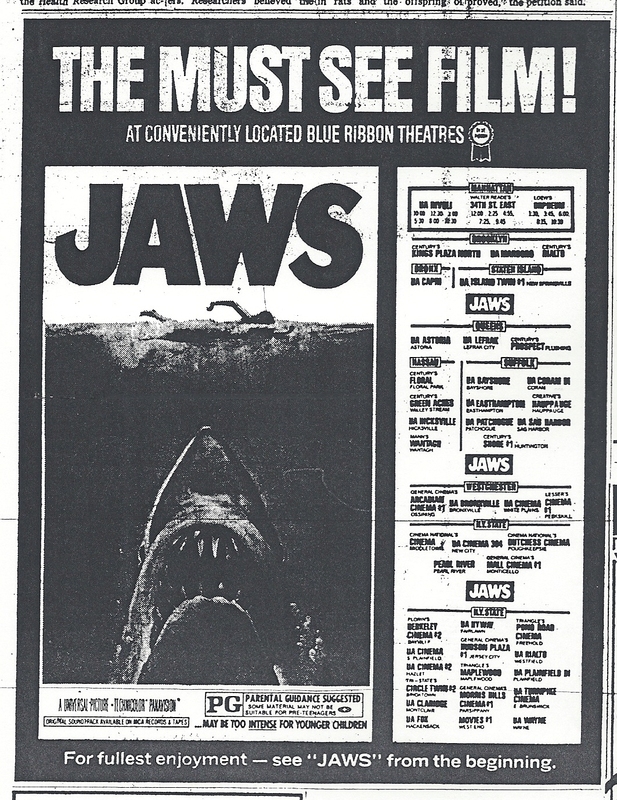 This past summer was the 35th anniversary since the release of “Jaws,” or as some look at it as the birth of summer blockbuster, saturation booking and the death call for Hollywood’s last great era. 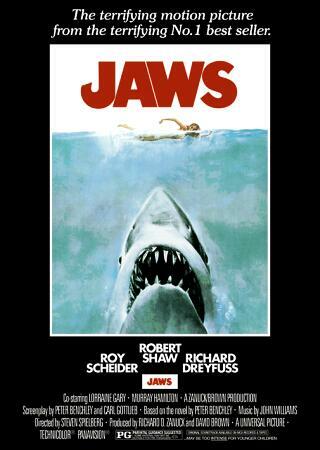 “Jaws” has been credited or blamed for it all. If you hate the way the news media focus’ on how much a film made this past weekend giving you the top three as if that were THE requirement for a successful film then you can blame ”Jaws.” Today the media seems to be preoccupied with box office results, the almighty dollars, as an indication of a film’s greatness, more so than the movie itself. But back in the summer of ’75 that was all in the future, or so it seemed. The first time I watched “Jaws” that hot summer was on a weekday evening. The theater was the Marboro in Brooklyn, a third tier local film house that I rarely attended. The place was packed and the air was thick with anticipation. Word of mouth about the film had spread like wildfire; it was THE film to see. Before a frame of celluloid was exposed the audience was hooked. The film did not disappoint, men, women and kids were on the edge of their seats. The shark’s first appearance sent tremors into the buttered popcorn filled air. It was the kind of group movie experience that only happens on rare occasions. The film was a tough shoot due to mechanical difficulties with the sharks (there was more than one), the unpredictable weather and running way over budget with Universal continually threatening to shut the entire production down. 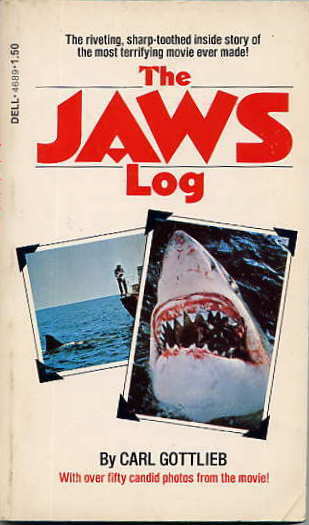 All this is excellently detailed in Carl Gottlieb’s book “The Jaws Log” and in “The Making of Jaws” by Edith Blake, two paperbacks that came out during the film’s release. The phenomenal success of the film changed the way Hollywood operated. Prior to “Jaws” Hollywood viewed the summer as a dumping ground, a slow period. Universal decided, with little competition out there they would flood the market with ads creating anticipation for a product that was already a bestselling book. High concept, the summer blockbuster, call it what you will it all started with this film. Young turk Spielberg became a Hollywood mega mogul, the actors, Roy Scheider, Richard Dreyfuss and Robert Shaw all had lucrative careers for years to come. Author Peter Benchley would go on to write “The Deep” among other novels, but more than anyone Steven Spielberg’s career would be most impressive. Like every grand successful film there were sequels (Jaws 2, Jaws 3D and Jaws: The Revenge) and low budget imitations like “Piranha”, “Orca: The Killer Whale”, “Mako: Jaws of Death” to name a few. The film was even parodied on “Saturday Night Live” with Chevy Chase as a Land Shark and Candice Bergen as the victim. So what about the film itself? Does it still hold up? It sure does. Sure it was made for just for pure entertainment, then again so was “Psycho,” (Spielberg and “Jaws” did for the ocean what Hitchcock and “Psycho” did for the shower) and in many ways it is just an old fashion monster film but Spielberg along with editor Verna Fields created a tense nail biter of a film that keeps your heart pounding throughout. Spielberg and crew created characters you cared about, characters much more likable than they are in Benchley’s novel, and are played to perfection by the three male leads. There is Quint the shark hunter for hire filled to the brim with macho bravado continuously showing that he is the man, the only man who can go head to head with the shark. Hooper the marine biologist and Brodie, the Chief of Police who recently left the New York City Police Department for what he thought would be a cushier job term as the Police Chief of a small Long Island tourist town. Spielberg mixes humor with terror throughout the movie. Right from the start in the opening scenes, we watch a girl run toward the ocean stripping off her clothes. Slightly behind is her inebriated boyfriend chasing after her claiming his sobriety. Moments later she is floating in the ocean and then we hear the first beats of John Williams now famous score as we watch the first brutal attack. Spielberg’s camera placement here, and for many of the scenes in the water, is at ocean level instilling a sense closeness, forcing us to be right there in the water with the victims. Later when they are on Quint’s boat one evening, drinking, reminiscing, the cantankerous relationship between the men slowly develops into a kind of camaraderie that happens only when a group have bonded in a life and death situation. Quint and Hooper compare battle worn scars attempting to top each other’s wounds. Finally Hooper rips open his shirt and reveals his heart and how it was broken by an old girlfriend. Whether they are crushing beer cans or Styrofoam cups, Spielberg’s use of humor only magnifies the shock of the shark that is never far away. And as mentioned earlier there is the John Williams music, the now oh so familiar theme that creeps up on you in the film, just hearing it makes you get the heebie jeebies. Spielberg’s use of the music makes you feel the shark’s presence, surrounding its victims, though in fact many of those times no shark is ever on screen. His use of the camera from the sharks POV is brilliantly effective. Sometimes what you don’t see is more frightening than what you do. Read more about Steven Spielberg’s film on the link below. This entry was posted in 1970's, Film Reviews, Steven Spielberg, Twenty Four Frames Favorite Films and tagged Jaws, Lorriane Gray, Murray Hamilton, Peter Benchley, Richard Dreyfuss, Robert Shaw, Roy Scheider, Steven Spielberg, Verna Fields. one of my favourite movies! thanks! Wow, John: that opening paragraph in which you note how a lot of people blame Jaws for the dumbing-down of the summer blockbuster echoes the notations I’ve been using in my own upcoming piece on the film… almost word for word! Now that is eerie. 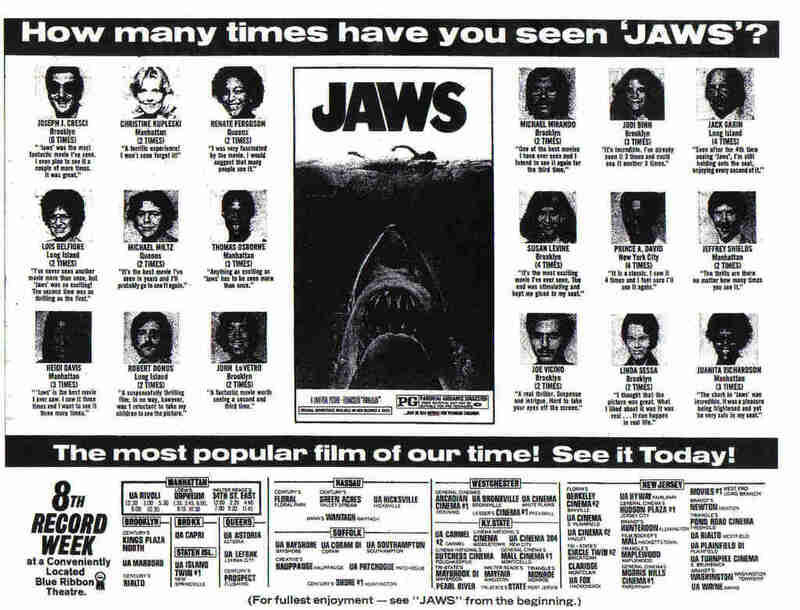 Whenever I’ve come to argue with fierce critics of Jaws, one thing I always ask them is, “how long has it been since you last saw the film?” Frankly I’m amazed when people say that Brody, Hooper and Quint are stereotypes. Repeated viewings of the film make it clear that all three of them are fully-functioning human beings! This is why I think Jaws is so much more than just a fun popcorn movie. I’m sure the filmmakers all set out to make grand entertainment, but I actually think they accomplished so much more than that. I see Jaws sort of as a “commercial art film”, if that makes any sense. Your story about getting to attend the movie’s release in ’75 is just one of so many great stories I’ve been reading during the blogathon about experiencing the movie in that moment. I really envy you guys for getting to live through that. I agree about the three characters, each of the actors, I think, also input some of their own touches into their character making them more three dimensional. 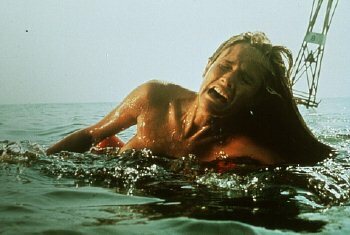 JAWS, like PSYCHO and CASABLANCA transcends its commercial roots. Pure pulp stories turned into pop art by master filmmakers. Note: Peter Benchley was not Robert Benchley’s son, but rather, his grandson. The lineage: Robert Benchley….Nathaniel Benchley (also a well known author; remember ‘The Russians are Coming, the Russians are Coming’? That’s Nat’s) and….his son, Peter (RIP). Believe it not I was aware of that and just screwed up. Thanks for the correction and I have fixed it in the posting. Thanks again!!! John, you really capture the excitement that surrounded the making of the film, it’s production difficulties and it’s eventually speactacular success that has placed it as a landmark in American culture. It’s one of Spielberg’s most enduring successes to this day, and as you note the launching of many successful careers can be directly attribute to this mega-blockbuster. Most still name this as one of Spielberg’s greatest achivements (with SCHINDLER’S LIST, E.T., RAIDERS, SAVING PRIVATE RYAN and A.I.) and as the one Spielberg film has boasts the most re-viewing potential. One of the most identifiable themes in any score is to be found with the menacing chords of John Williams. Well, Sam, I am in that same group that consider JAWS still one of Spielberg’s best. For me, it is a film you can watch repeatedly and never get tired of it. I actually agree with your list of SP greatest except for SAVING PRIVATE RYAN which starts off spectacularly but slips into a typical John Wayne style film in the second half. I would replace it with EMPIRE OF THE SUN, an underrated Spielberg film. Thanks again Sam for all your support. John, I may have been unclear when I named the films that MOST Considered Spelberg’s finest. There is NO Spielberg film I love more than EMPIRE OF THE SUN. Unless I misunderstood Sam. I knew you were a big fan of EMPIRE OF THE SUN so I was suprised not to see it listed. Thanks, definitely the kind of film one can watch repeatedly.